Berkhamsted completed an excellent double over third-placed Cockfosters thanks to a Matt Bateman hat-trick on Saturday in a 3-1 win. Boss Steve Bateman was forced to make five changes to the side that won the Herts Charity Shield in midweek (see p39). 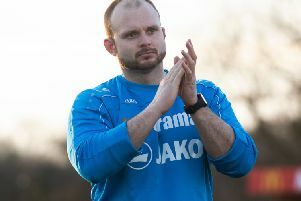 Steve Hawes was injured in the final, but Jack Stevens had recovered from illness to fill the gap while keeper Carl Tasker was back in the country. Berfore the game, a large crowd held a minute’s silence for the Westminster terrorist tragedy and presentations were made to Lewis Rodrigoe for 350 first-team appearances and Tasker for 250. Ioannis Varouxakis is one of the division’s top scorers and he had the best chances to put the club record-breaking Cockfosters side ahead. He got round Tasker only to see one shot kicked off the line while Tasker saved another. Meanwhile at the railway end Ashton Campbell and Dan Jones had chances for Berko while Cockfosters’ Callum Lee got a first-half booking for a late foot into Tasker after the keeper had claimed the ball. Berko got their noses in front with a super goal. Jones won the ball and fed Alex Campana and his excellent cross was brought down by Matt Bateman, whose shot whistled past keeper Austin Bayfield. In the second-half, Campana set up Dan Weeks but his shot flew over the bar. After being injured for the last eight matches, skipper Jim Baldry was fit enough to come on for injured defender Max Farrelly. Cockfosters’ new signing from Hertford Ben Andreos came off the bench and hit the equaliser with Tasker doing his best and getting a hand to the shot. Tasker then had to save from Varouxakis as the game became more open. Matt Bateman restored Berko’s lead with 20 minutes left when he did well to place a shot past Bayfield after he had been played in by a fine pass from Jones. Bateman completed his hat-trick when carefully steering a header home from a super cross by Campbell, who beat his man on the wing. It was his first hat-trick of the campaign and he came off to a standing ovation, with 16-year-old Will Bisney coming on for his first-team debut. The Berko crowd went away happy after witnessing their side’s sixth win of March so far. Last night (Tuesday) Berko were due to go to Oxhey Jets for a league game with Adam Mead and Ashley Lewis still suspended. This Saturday’s home Premier game is against Edgware Town. Lewis will be able to return but Weeks is still banned.